Approaching Soweto today, it’s hard to think of this sprawling township on the edge of Johannesburg as a where the beginning of the end of apartheid was triggered after scenes of brutal racial oppression were witnessed on TV news bulletins around the world. My first impressions of the city within a city of some three or four million inhabitants was that it actually seemed quite pleasant. I passed smart detached houses that could have been lived in by millionaires, with Porches parked behind tall security gates. And the roads were well-maintained and networks of electricity pylons clearly meant that residents were getting the essential services they need. 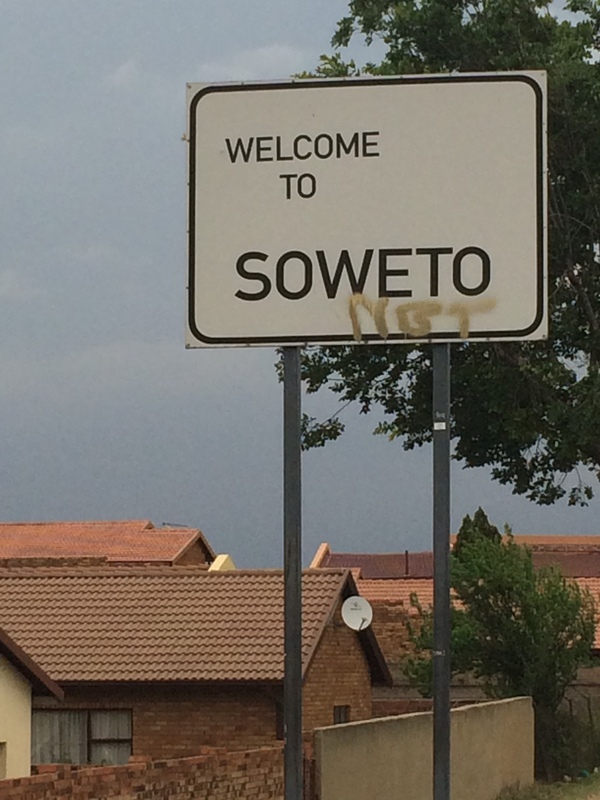 I had expected Soweto (short for South West Township) to be nothing more than a shanty town. But this is a place of real contrasts and you need to delve a little deeper. In reality, Soweto today is made up of a number of different suburbs, catering for the middle and upper classes (provided with smart shops and even plush car dealerships), as well as people living in desperate poverty in little more than shacks (hardly fit for habitation by animals and without access to utilities). Driving around the township, which stretches for as far as the eye can see, it’s surreal how close together these two different worlds exist. What is known as Orlando was established in the 1930s for 80,000 blacks and was the first part of Soweto. Although racial segregation had been taking place for some time, it was officially declared a black dormitory town at the inception of apartheid in 1948. This system of segregation which lasted until 1990 kept white and black people in separate areas of cities in South Africa using the most brutal means of control. Some three million black people from across the country were uprooted from their homes to satisfy government planners and millions more were imprisoned for infringing apartheid regulations, such as going into zones that they didn’t have a pass for. “Every facet of their life – residence, employment, education, public amenities and politics – was regulated to keep them in a strictly subordinate role,” writes Martin Meredith in his book, The State of Africa, of the treatment black people faced under apartheid. Johannesburg’s thoughtful Apartheid Museum offers an intriguing insight into the PR offensive that the white South African government that undertook to explain why the system was introduced. Ministers not only claimed in recorded clips shown in the exhibition that they were doing non-whites a favour, but that other countries in the world would follow their lead. “Apartheid could just as easily be described as a policy of good neighbourliness,” is a quote from South African Prime Minister, Hendrik Verwoerd,that stood out for me at the museum. Visitors are randomly given tickets which classifies them as either non-white or white, meaning that groups are split for the first part of the exhibition as they proceed through different entrances. It’s just one of the powerful tools, the museum uses to demonstrate the humiliating treatment many faced under apartheid. In the northern suburbs of Johannesburg the white population lived a life of luxury, with the greatest concentration of swimming pools after Beverley Hills. Meanwhile, millions of black labourers were forced to live in appalling conditions in barrack blocks miles away from their families or spend hours on overcrowded buses getting to work. Skilled trades were largely reserved for white workers and it was Afrikaners who benefitted most from government farming subsidies. 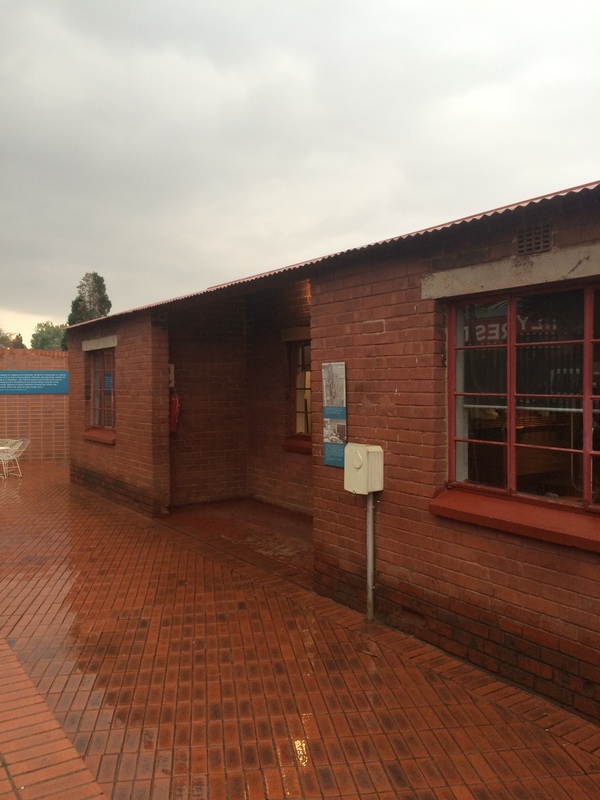 In Soweto only a small population had electricity or adequate plumbing. In fact, in the 1970s an average of 13 people were said to live in the tiny homes and industrial wages were 30% lower than the income needed to raise a family of five. The situation worsened as blacks lost their tenancies on white farms and they flocked to the squalid, overcrowded townships. The National Party won the election 1948 on a ticket of the white minority’s fears of losing their jobs to the black majority, who were prepared to work for lower wages. And soon after their victory, apartheid was introduced. Yet although apartheid was introduced in 1948, in many ways racial segregation in South Africa went back much further (in fact the Apartheid Museum’s introductory film takes the story back a full two and a half thousand years). Black people were disenfranchised at the formation of the Union of South Africa in 1910. And in 1913 an Act was passed, which confined blacks to less than 10% of the land. “If there was to be equal manhood suffrage…. the white would be swamped all over South Africa by the blacks, and the whole position for which the whites have striven for two hundred years or more would be given up,” said Jan Smuts in 1921. Key of course for Johannesburg was the fact that thousands of people had come to the city to work in the gold mines. Authorities were keen to separate out black workers who lived in mining compounds. “I am slowly being confirmed in my opinion that Johannesburg is Hell. Every man living for himself, every man fighting for gold, gold, gold and trampling down everything that stands in his way,” said Olive Schreiner in 1899. Authorities used a bubonic plague in 1904 as an excuse to remove black people from inner city areas. More forced clearances followed in the decades that followed. As industrialisation took hold in the early 20th century and black workers flooded into urban areas, white supremacy was under threat. What the government essentially wanted was a system where black people lived in townships on the edge of big cities like Johannesburg and only commuted in for work using the train network that was built. 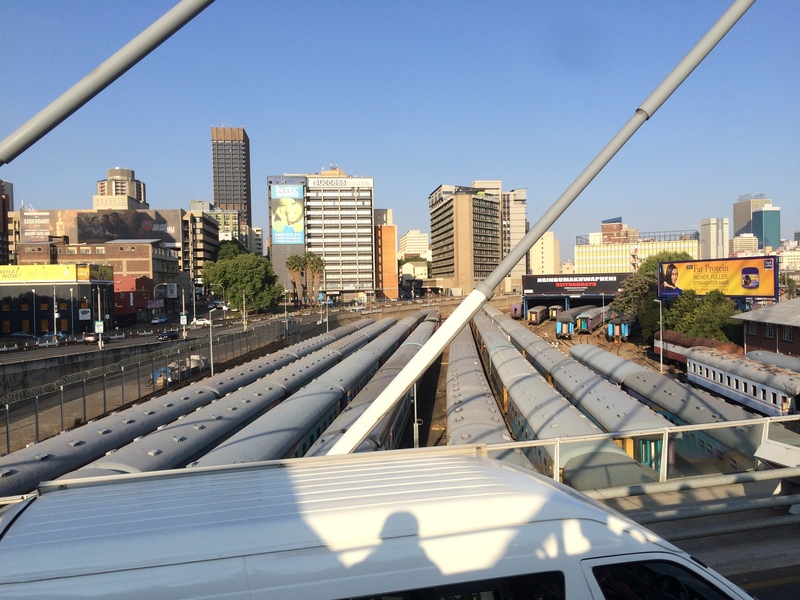 Park Station is a major hub that provides a link to Soweto and it was here that many workers who held jobs in the city would arrive during apartheid. Of course, apartheid – and the restrictions blacks faced before it was formally introduced in 1948 – didn’t go unchallenged. The African National Congress (ANC) was formed in 1912 by middle-class mission educated Africans, but they were initially fairly ineffective, making speeches that by many accounts achieved little. Things moved up a gear in the 1940s, however, when the party entered a new militant phase with the old guard ousted – civil disobedience, strikes (the African Mineworkers’ Union’s strike in 1946 was one of the biggest in history) and mass boycotts became the order of the day. With the ANC’s 1952 Defiance Campaign, volunteers were deliberately asked to push for arrest by entering areas restricted to whites, including waiting rooms and carriages. More than eight thousand people were jailed in five months. In the aftermath there was considerable violence, with an instance of police firing on a prayer meeting in East London that left two white people dead after a riot broke out. Numerous ANC organisers had “banning” orders that restricted movement, stopped them seeing more than one person at a time and prevented from entering certain buildings. But tragic events unfolded at Sharpeville police station, south of Johannesburg, in 1960 when police opened fire, killing 69 black people – most of the casualties were shot in their backs as they tried to flee the scene – and injuring nearly 200. Protests were held across the country and the government ordered a state of emergency. Although the ANC had stepped up its campaign since the 1940s, for some in the now-banned party (which operated underground) things had not gone far enough and they need to resort to military means. But given that not all could agree to a shift in policy, it was decided to form a new armed wing of the ANC. Nelson Mandela – the lawyer who had started the ANC Youth League in 1946 and in recent years had been move from town to town, as well as wearing a variety of disguises to evade detection – was appointed the group’s commander in chief, known as MK and which had orders not to kill or injure people. I visited the three-room bungalow house in Vilakazi Street (once also home to Desmond Tutu and now lined with touristy restaurants) in Soweto where Mandela lived from 1946 to the early 1960s, firstly with his wife, Evelyn Ntoko, and then from 1957, with his second wife, Winnie. Sadly there have been a number of fires over the years, meaning much of the original interiors has been wiped out, but some of the furniture he used was saved and there is much memorabilia. But in 1962 Mandela’s luck ran out when he was captured and in 1964 was sentenced with eight other ANC members to life imprisonment. He was flown to Cape Town and then taken by ferry to Robben Island where he spent 18 of his 27 years in captivity. Following his release from prison in 1990, he spent a brief 11 days at the house in Vilakazi Street, before being persuaded he needed somewhere more secluded. Mandela and his comrades were however by no means the only people to be imprisoned under apartheid, as I found visiting an important area close to the Central Business District in Johannesburg. Read more in next blog.